Have you ever hiked the Appalachian Trail or one like it? One of the great pleasures is to enjoy a walk in the woods and fields without having to stumble through the brush or worry about what’s underfoot. You can move quietly through nature, enjoying the wildlife around you. Those of you with natural areas on your own property probably would enjoy it more if you had nice trails to walk on year-round. A good trail is wide enough for two people to walk side-by-side but not wide enough for ATV’s. There are no overhanging branches or stickers to grab you on the way past, and the treadway drains quickly when it rains so there’s no mud. The slopes are gentle, — not more than a 10% percent grade to climb. It’s well marked so you won’t lose your way. Trails like this take some planning and hard work to create but good trails are easy to maintain once they’re in place. • Build trails along, not up and down, hills and slopes. Otherwise they’ll wash out or be too steep to walk comfortably. Ridgetop trails are best. • Trails through woods are easiest to maintain, and trails through open, sunny areas are hardest (believe it or not). • The more hard work and trouble you invest building your trail, the easier it will be to maintain so you can enjoy walking it. • Trail design and building is easiest in late fall through early spring. You can see better, it’s cooler, and there are less insects. “Benching” is the real work of trail building. 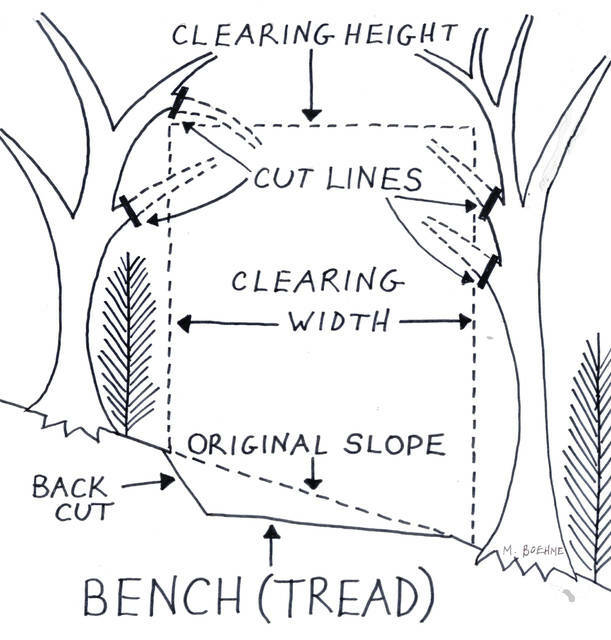 Benching means cutting a shelf or treadway wide enough to walk on, along the sides of slopes. Every rock, stump and woody plant must be thoroughly dug out, and the ground leveled off, with just enough slope that water can drain off. It’s tempting to save work by zig-zagging around trees and rocks, but sometimes the best route requires major work to dig out obstacles. Mudholes are no fun to hike through, so your bench must be carefully smoothed and sloped to eliminate low spots in the trail. On our farm we have a combination of certified hiking trails and what we call “tractor trails”. These are pathways wide enough to mow with a bush hog or a riding mower. If you have a lot of trails to maintain (we have several miles), particularly if these trails cross sunny pastureland, being able to clear them from the seat of your tractor is a huge time saver. On the other hand, narrow foot trails are less tempting to trespassers on ATV’s. There’s more to trail planning, building and maintenance than we can explain in this short article, but if you are interested here’s how to find out more: Take a look at this website: http://traildesign.tripod.com/reference.htm or Google “trail building” for lots of resources on this topic. We are very fortunate that our farm is along the Buckeye Trail, part of the North Country Trail system across the Midwest. North Country Trail volunteers built a one-mile “loop trail” on GoodSeed Farm, an investment of hundreds of man-hours. Watching the process of building “certified trail” was a real education for us, and we enjoy countless hours hiking on our own property. You can, too, since the North Country Trail is open to the public. For more information on the Buckeye Trail, check out www.buckeyetrail.org and www.northcountrytrail.org. 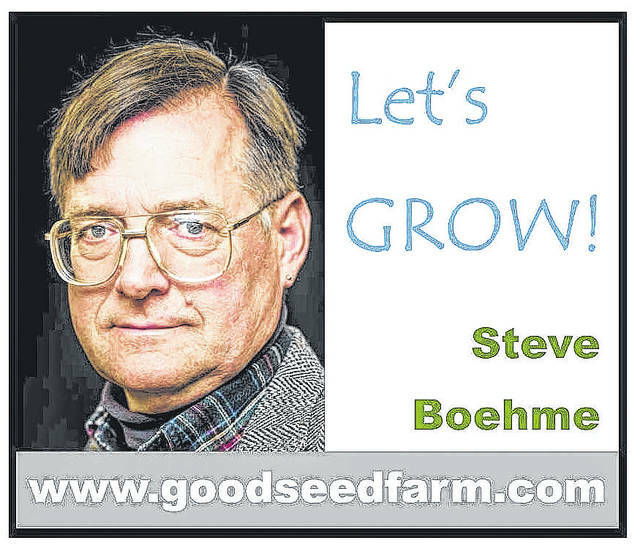 Steve Boehme is a landscape designer/installer specializing in landscape makeovers and Aim Media Midwest columnist, www.goodseedfarm.com.